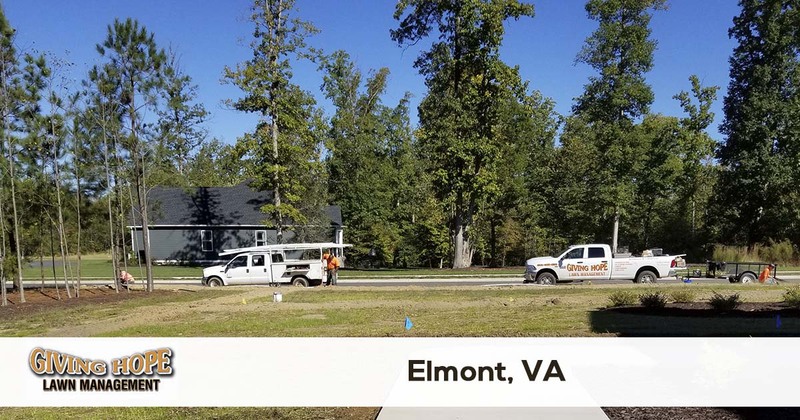 Giving Hope Lawn Management is proud to serve the community of Elmont with professional lawn care and landscaping services. For more information or to get a free quote call us today at 804-839-8340. It may be harder to believe now, but at one time Elmont, VA, was just a small farming community. Today, it seems as if everyone commutes to Richmond for work. Unfortunately, that means it can get challenging to hire the service providers you need for your home or office. Finding an Elmont lawn care team for your plants can feel impossible! But you don’t need to stay frustrated at your lack of options. Instead, you can always call the reliable choice of local landscaping services. Giving Hope Lawn Management remains the trusted choice in local yard care solutions. From faulty irrigation systems to affordable monthly grass mowing, we do it all! Why should you stay disappointed with the other landscaping companies? Instead, you can have the team that has given more homeowners hope since 2011! Even when you think that no one else is servicing your area, our team provides the best landscaping to more residents. We only offer prompt service, quality results, and the lowest pricing possible! We can help you save on more types of yard care services than with any other provider. Whether you have a new construction lot or are planning a whole lawn redesign, we are here for you! Stop spending too much on companies that get results. Instead, call the team that makes your lawns greener for less! For the best solutions at the right prices, you can depend on us for your yards each time. Call now for your affordable landscaping experts! Giving Hope Lawn Management is the industry leader for lawn care and landscaping in Elmont. We offer a 100% satisfaction guarantee with all of our services, so there is no risk for you to give us a try. Give us a call today for the fastest service at 804-839-8340.